Art therapy is something that has a long history as an effective method of calming nerves and soothing the mind, and something that is sought after in today’s high stress modern environment. It has been defined as a form of psychotherapy that uses the mediums of art as a tool of expression and communication by the British Institute of Art Therapists, It brings to mind the calm practices of sand mandala creation and destruction by Tibetan monks or the meticulous and patient pattern creations of Eastern art, that seem to render in the creating artist a sense of focused purpose and mental calmness. And gives an uninhibited liberation of free expression, much like a Jackson Pollock painting or a form of communicative symbolism expressed through the highly energized works of Jean-Michel Basquiat. How and when Art therapy can be administered varies greatly, depending on if it is administered by a trained and qualified practitioner or by creatives more inclined towards free expression and relaxation. 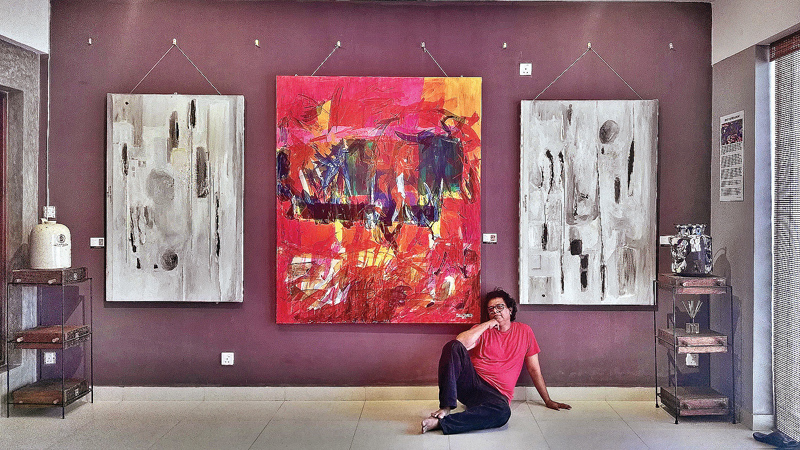 For contemporary Sri Lankan artist Mueen Saheed, the therapeutic qualities of art have served him well, in retiring from a successful yet challenging career in the Jewellery trade, and turning towards his lifelong calling as a full time career artist. Last year Mueen was sought after by the 5-star Luxury resort JumeirahVittaveli in the Maldives, to conduct a session of Art Therapy for the guests, many of whom were there to relax and get away and rejuvenate from their busy lives. “It is never a question of teaching art, its merely pointing towards the canvas and creating the environment and the state of mind, where things from within people can take form, physically through colour and movement,” Saheed said. This is particularly the case with abstract art for Mueen. “I started out by drawing rings and jewellery, which is highly dependent on form. You need to create a realness and be able to play with depth to bring to life the three dimensional quality of the jewellery you want designed,” he said. Mueen also Participated in the India Art Festival in Delhi and The Oxford international Art Fair in 2018. The fair in Delhi demonstrated how fast India’s art scene is advancing, while the Oxford fair sponsored by The Wall Street Journal. He has few exhibitions planned for 2019, including the Art Capital Fair at the Grand Palais in Paris, And the Florence Biennial in Italy, an invitee only fair, where he was pre-selected by a committee of international curators. Here he will be competing for the ‘Lorenzo ilMagnifico’ Award for the Visual Arts.